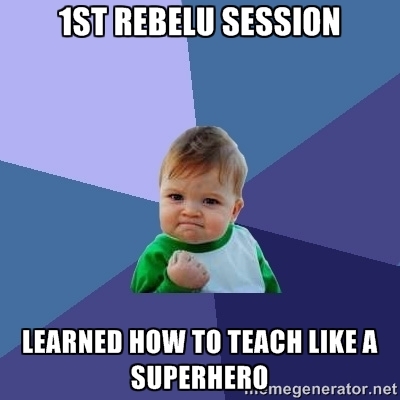 At the beginning of the school year, our Technology & Media Team puts on a professional development day, Rebel U. This year, I led a session titled, "Teaching & Learning Like a Superhero" where I focused on the different elements of lesson design and how technology tools and resources could be used to support each of the components. There were many different tools and resources that were presented in my session, but I wanted to provide different resources that could be used by all teachers K-12. As part of my presentation, I had teachers participate in a backchannel. My purpose in including this activity to engage teachers in conversation during the session, in addition to the verbal discussion we were having. Like many of our students, I have found that when presenting to teachers, many are more apt to participate when they can verbalize their thoughts and ideas in different ways. My presentation was in the group of first breakout sessions (first thing in the morning), so I don't think my audience was fully in the "wake up and get ready to learn" state yet. By the time I presented most of my presentation and got to the summarizers part, I had a fun activity for them to participate in. I had wanted each teacher to share what they have learned so far in my session in the form of a meme - summarizing their learning in a fun and engaging format. I provided 2 sites for creating memes (Meme Generator and imgflip), but told teachers they were free to use whichever resource they wanted to for creating their meme. This was an idea that was presented to target middle school and high school students, but could be applied in different (more age-appropriate) ways to elementary students as well. The concept was well received and those that were following us on Twitter and Facebook started receiving comments and teachers were really actively participating in the learning activity. I think it demonstrated that a summarizer activity can be short as well as effective (and it always helps when an activity is modeled for teachers to see and participate in). Below is the meme that I created as an example to show what a meme was for those who didn't know as well as explain how to create a meme.